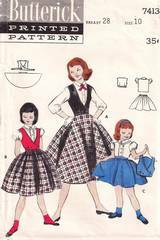 Vintage Butterick sewing pattern 7413. Circular skirt has side zipper and waistband with elastic back. Tailored blouse has short puffed sleeves or below-elbow sleeves gathered to bands. Westkit has a two button front closing and a slip-thru tab extending to a single back button closing.